Whatever happens in Monday night’s national title game, either Kentucky or Connecticut will become one of the most rare champions in the NCAA Tournament. With 11 titles between the two, the Wildcats and Huskies aren’t in a spot they’ve never been, even in the last five years. But both have taken a path to the title game that, while not unprecedented, puts each school in exclusive company. The Connecticut Huskies and the Kansas Jayhawks is a matchup that would be fitting for the Final Four. Day one of the first round of the 2016 NCAA Tournament brought us a smattering of exciting upsets and fantastic finishes. From Arkansas-Little Rock's double overtime rally against Purdue to Yale's first-ever NCAA Tournament victory, college basketball fans got to enjoy the type of moments that make March Madness so captivating. And that was just on Thursday. 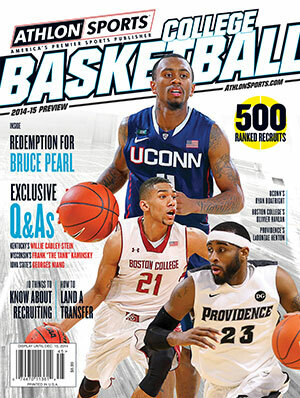 Here’s the burning question about the 2014-15 UConn Huskies: Are they still hungry? Until recent months, the No. 1 name atop the list of top freshmen in the American Athletic Conference would have been clear. SMU’s Emmanuel Mudiay may have been the top freshman in the country. The Mustangs may still be an NCAA Tournament team even without one of the NBA’s top prospects at point guard. That’s partly due to another influx of transfers into Larry Brown’s program. New arrivals from Xavier and Texas Tech — both eligible immediately — will give the Mustangs players with experience at a high level. The 2014 national championship was not a good one for the numbers people. A No. 7 seed and a No. 8 seed reached the national championship game, a development that in some ways rendered the regular season moot. UConn also didn’t fit the statistical profile of a team to win the national championship, falling short of efficiency ratings that have been the trademark of every national champion for more than a decade. The 2014 national champion has been crowned, so now it's time to take a quick look ahead at next season. Consider this a quick snapshot of the 2014-15 season. A handful of developments still need to happen before there’s a clearer picture of the season ahead. McDonald’s All-American Myles Turner has yet to commit, and he’s down to a handful of power players — Kansas, Texas, Oklahoma State, Ohio State, SMU and Duke. The Hungry Huskies outdueled the new Fab Five for one of the most unlikely NCAA championship runs in Tournament history. UConn defeated Kentucky 60-54 for the Huskies’ fourth national championship Monday, as a traditional power won the title in untraditional ways. Not many teams can say they’ve defeated every team on their schedule. If Florida make it to Monday night (and so does Wisconsin), the Gators can say they’ve answered all comers even if they've lost twice this season. In an odd turn of events, the only two teams that defeated Florida during the course of the season, Wisconsin and Connecticut, are in the Final Four. The third team, Kentucky, is one Florida has faced three times the year. Beat UConn and Wisconsin, and Florida can say it defeated everyone on its schedule at least once. Coaches in the Final Four by now have completed the scouting process and are starting to implement the game plans they hope will lead to a national championship. If you’re wondering what the coaches are seeing, Athlon Sports hopes to offer some insight. We spoke to coaches who compiled scouting reports for teams that faced the Final Four teams either during the NCAA Tournament or during the season. In exchange for more candor, we quoted the coaches anonymously.